A dozen red roses on Feb 14th. We had a stroll around London zoo in the daytime, and cooked a yummy dinner in the evening. I love Valentines day! Lunch at the Ivy in Beverly Hills, L.A. I took my mummy with me, and we enjoyed some champagne and the most delicious tacos I've ever eaten. The Ivy is really pretty, if your ever in Los Angeles you have to check it out. Ask to be seated outside! Hollywood... Whilst in Hollywood we did the touristy thing, as my mum had never been before. I spotted this empty star on the Hollywood walk of fame, I wonder who will end up claiming it? Love... My Charlotte Tilbury Dolce Vita Palette. Probably the love if my life, and a review is well overdue. I don't think a day has passed where it hasn't been all over my eyelids. Drinks atop the Cheesecake Factory, San Fransisco. Great views, great food and great company. My friend Lisa happened to be on the same flight as me, so we indulged in delicious cocktails in between a day of shopping. I had the skinny sangria - to die for! Party time... A good friend of mine had a very glamourous black tie ball in celebration of his 30th birthday. I wore a long black floor length evening dress with eyelash lace panels, it was such a great opportunity to dress up! Myself and my friend were probably definitely pretty drunk by the time this photo was taken! I hope everybody had a wonderful February and I can't wait to see what March will bring! You can follow my Instagram @mimiflys if you fancy a nosey... See you there! Mimi, I love this style of post from you! I can't wait to read your Charlotte Tilbury review! 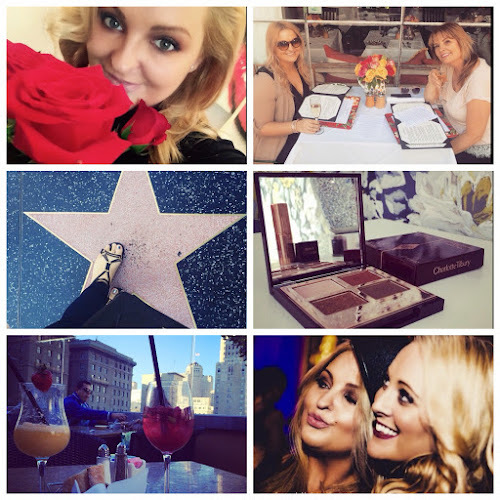 Glad you had a great month and love your make up look in the photo with your roses! That is a glamorous February for sure. Glad you had a great time with your mum. Thank you for leaving a comment, I appreciate every one.